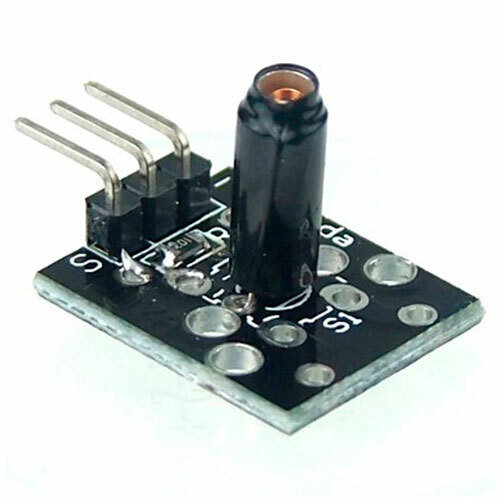 Digital Temperature Sensor KY-028 for Arduino, it measures temperature changes based on the thermistor resistance. This module has both digital and analog outputs, there's a potentiometer to adjusts the detection threshold on the digital interface. The KY-028 consist of a of a NTC thermistor, a LM393 dual differential comparator a 3296W trimmer potentiometer, six resistors and two indicator LEDs. The board features an analog and a digital output. 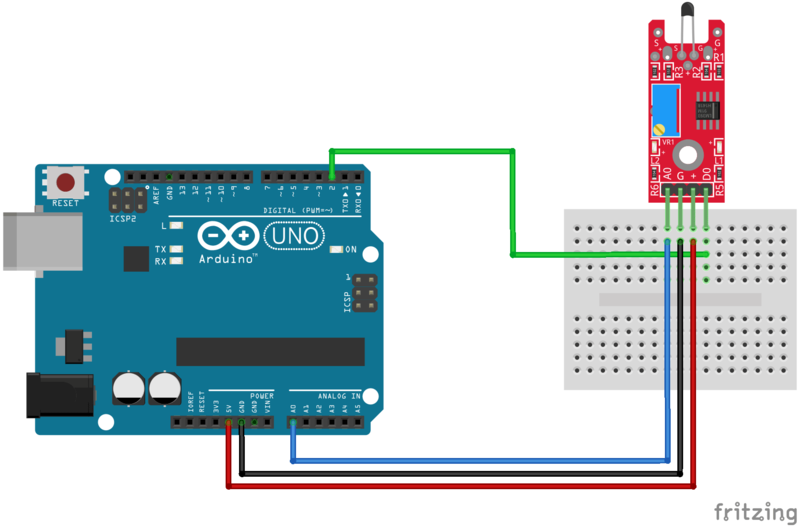 Connect the board's analog output (A0) to pin A0 on the Arduino and the digital output (D0) to pin 3. Connect the power line (+) and ground (G) to 5V and GND respectively. When the temperature threshold is reached, the digital interface will send a HIGH signal turning on the LED on the Arduino (pin 13). Turn the potentiometer clock-wise to increase the detection threshold and counter-clockwise to decrease it. The analog interface returns a numeric value that depends on the temperature and the potentiometer's position. Since analog output pin is directly connected to the potentiometer it isn't possible to use the Steinhart-Hart equation to calculate the temperature as as we did with the KY-013, we can only use this value to measure relative changes in temperature. Fritzing Part: KY-028 Digital Temperature Sensor Module.